Are you interested in doing research on campus? 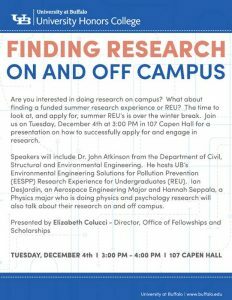 What about finding a funded summer research experience or REU? The time to look at, and apply for, summer REU’s is over the winter break. 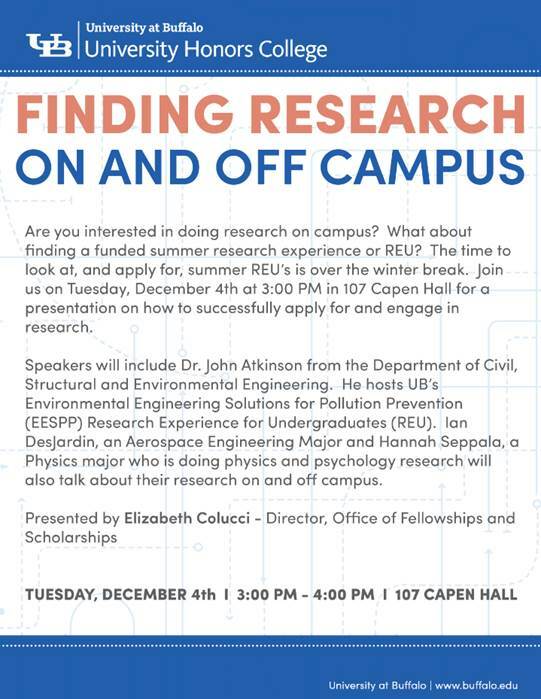 Join us on Tuesday, December 4th at 3:00 pm in 107 Capen Hall for a presentation on how to successfully apply for and engage in research. Speakers will include Dr. John Atkinson from the Department of Civil, Structural and Environmental Engineering. He hosts UB’s Environmental Engineering Solutions for Pollution Prevention (EESPP) Research Experience for Undergraduates (REU). Ian DesJardin, an Aerospace Engineering Major and Hannah Seppala, a Physics major who is doing physics and psychology research will also talk about their research on and off campus. Brought to you in part by the Office of Fellowships & Scholarships and the Honors College. If you have any questions, please contact Allison Suflita at asuflita@buffalo.edu.